Aside from playing together in the same backfield for the UCLA football team that went undefeated in 1939, both KENNY WASHINGTON and JACKIE ROBINSON shared something else in common — each spent one season as the starting shortstop for a Bruins varsity team that posted a record of six wins and nine losses in California Intercollegiate Baseball Association play, as well. 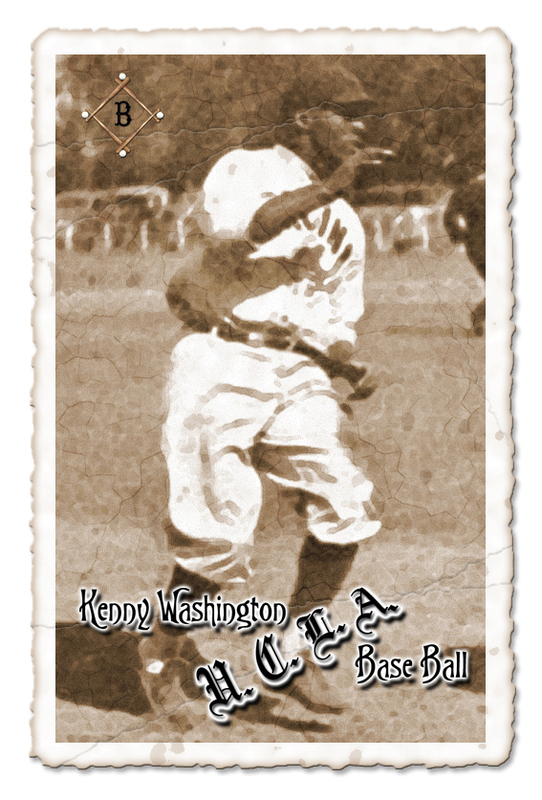 After establishing himself as a genuine star on the gridiron football field by totaling a combined 1,025 yards rushing and passing at the pivotal left halfback position for UCLA in the fall of 1937, Washington, as had been widely expected from the moment he first stepped foot on the Westwood campus, took over as the Bruins starting shortstop on the baseball diamond in the spring of 1938. And the sophomore out of Abraham Lincoln High School in Los Angeles certainly did not disappoint the faithful at the plate, either. Two-thirds of the way through the fifteen-game season, the newcomer Washington found himself leading the entire C.I.B.A. circuit with a .454 batting average. Although his production declined somewhat down the stretch, Washington still finished as UCLA’s second-leading hitter sporting a healthy .397 average and also led the Bruins in both home runs as well as runs batted in. A transfer from Pasadena Junior College, multi-sport star Jackie Robinson had already earned two varsity letters at UCLA before slipping into his baseball spikes on behalf of the Bruins for the very first time. As the first string right halfback for the Westwood gridiron warriors, Robinson led the entire nation by averaging 16.4 yards per punt return while adding another 512 yards rushing (12.2 avg) in the fall of 1939. On the basketball court in winter, the would be Major League Baseball Hall Of Famer scored more points (148 in 12 games) for UCLA during the 1939/40 campaign than another other player in the Bruins’ four-team league which included California, Stanford and USC.